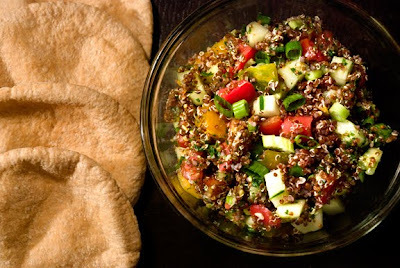 substituting the bulgur wheat normally found in tabbouleh with red quinoa. Quinoa, unlike most other grains, contains a full set of essential amino acids, making it an unusually complete protein source for those of us who try not to eat too much meat. This salad can be served on its own (lowest calorie option), or in a whole-wheat pita pocket with a slather of hummus and a sprinkle of crumbled feta… so yummy! Rinse the quinoa in a fine mesh sieve for several minutes (this removes bitterness). Place the quinoa and 2 cups of water in a small saucepan. Simmer, covered on medium low until all the water is absorbed. Approx. 20 minutes. In a food processor chop the parsley and garlic until very fine. In a small bowl mix together the juice of one lemon, salt, black pepper, mustard, and olive oil. In a large bowl combine the tomatoes, cucumbers, scallions, quinoa, parsley, garlic, and lemon juice mixture. Season with additional salt and lemon juice to taste. Serve as is (lowest calorie option) or in a whole wheat pita with hummus and crumbled feta. Looks delicious! I would opt for the "non" low calorie option ... give me the pita bread, hummus and feta! Looks so fresh - bet you'll miss all these fresh veggies in the winter. Guess you'll have to go to baking (hint-hint). BTW, love the tomato harvest photo. This looks so colorful and delicious.